Home / Blog » Should Physicians Use Social Media? Social media has changed our relationships, the way we do business and even how we get health information. It is now the number one activity on the internet. So should you, as a physician, consider social media as part of your marketing strategy? The answer is yes, and many hospitals and physicians have already joined the social media revolution. DC Interactive reported that 26% of all hospitals in the US participate in social media. Of more than 1,500 hospitals nationwide who have an online presence, Facebook is most popular. Additionally, YouTube traffic to hospital sites has increased an impressive 119% year-over-year. 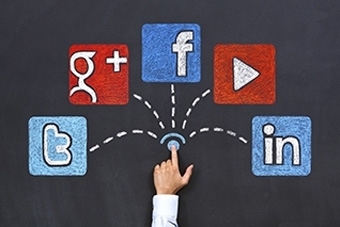 Here are three reasons you should consider a social media strategy. In the US, there are more than 250 million people on Facebook, 107 million users on LinkedIn and 65 million users on Twitter. As of January 2014, Pew Research Internet Project reported that 74% of online adults use social networking sites. That’s an impressive jump from just 40% just 5 short years ago. It seems social media is the new ‘word of mouth’. Patients that are actively engaged in social media can have a major impact on your professional reputation. On Facebook, there are groups about almost every medical condition which allow patients to connect with others in similar circumstances and share experiences and information. And they are doing just that. Social media allows physicians to engage current patients and build a connection with new patients by providing relevant, engaging and educational information. Not only that, it allows you to build credibility and trust, particularly for a younger audience. A study compiled by Demi & Cooper Advertising and DC Interactive Group shows that more than 90% of people ages 18-24 said they would trust health information they found on social media channels. Additionally, 60% of social media users say that they trust social media posts and activity by doctors over any other group. Sixty percent of doctors say that social media improves the quality of care to patients according to a study published in the Journal of Medical Internet Research in 2012. It‘s an easy way for them to get useful, engaging, high quality information and also allows them to share medical knowledge with others in their field. Two-thirds of doctors use social media for professional purposes. Social media should be a component of your marketing outreach. In a 2013 survey of plastic surgeons, about half said that social media was an effective marketing tool and a useful forum for patient education; and about one-third saw positive effects including increased exposure to their practice. Social media can give you a strong competitive advantage. It’s a communication channel that allows you to immediately connect with your patients. It also allows physicians to connect with each other, develop strong networks and communicate in ways that weren’t possible in the past. Social media is not the future of marketing. It’s today’s marketing. If you don’t already have a social media presence, now is the time to start building one. By expanding your online presence, your practice can grow right along with it. Your Practice Online can help get you started. Facebook, Twitter and LinkedIn website, 11/2014. Pew Internet Project, June 2012 report.